Looks like you got some real good results. Nice job. Your crumb and crust look real nice. The blisters on the crust are awesome. Nicely done. Thanks Floyd. Yes, the blisters are there, the crust colour is good, now I just want a little more sour. I have never tasted San Francisco Sourdough so I don't really know what to aim for, but I am sure (from what others describe) it is sourer than what I have been producing. Just wish I could taste some so that I knew what to shoot for. Syd! Spectacular blisters is all one can say. Very nice indeed. What an outstanding looking loaf! Now you have 2 breads on your list that take 3 days to complete. Your Pain de Mie and now it's opposite. You can really be a bread baking 'slacker' now....just make the yeasties and beasites do all of the work for you. Thanks Janet. My loaves have to fit into my schedule and never the other way around (except of course if I am on holiday). What I bake is almost always dictated by the amount of time available and at what times I can be at home (to fold, shape, etc). Just wish I had a month off to experiment and bake to my heart's desire. Thanks for commenting. When my kids were really young I used to bake bread about 1x a month because it was so time consuming. In those days I didn't know about mixers for kneading bread, how to use wild yeast for leavens in my doughs, S&F or using the refrigerator to slow things down....Needless to say I was at the mercy of the dough. As my kids got older I totally didn't have time to spend tending to dough so I pretty much stopped baking bread. So I completely understand and appreciate how you fit baking into your schedule. Well I can't keep up with you either, especially when you go baking all these fancy breads with even fancier ingredients, half of which have never even been heard of in my neck of the woods. Thanks David! Josh's process is definitely worth a try. 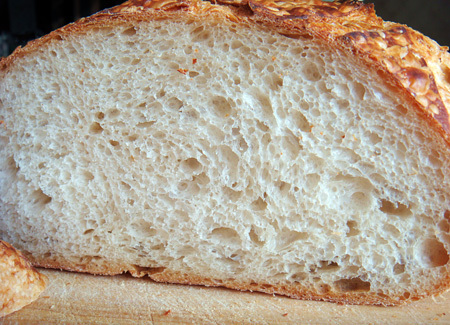 You will probably get better results in terms of getting a more sour loaf, especially with your flour mix. Thanks for commenting. I am reminded of Yippee's beautifully-blistered-boule, and cold fermentation employed, as you have done here. when I saw your other stunning loaf, currently on the front page! Thanks breadsong! Well I have been working on this one long enough now! I have one or two more things I want to try but I am pretty satisfied with it now. I think I might even have a handle on the too mild a sour problem but just need one or two more shots at it to confirm. The dark background is our coffee table at home. I like to photograph my bread there because it provides a nice contrast and there is nothing to distract from the loaf itself. I had forgotten about Yippee's post but now I remember the pictures since I had a look again. They look stunning. The do look like near twins on the outside don't they? Just different scoring. You have such a good memory breadsong. Both are beautiful as bread or even art objects. Yes, I do agree, Syd's bread is art! And I can't get over the spectacular colors in the crust for this bread. 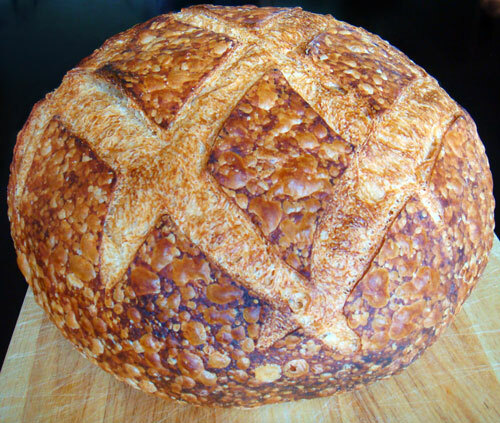 Re: memory, it turns out mine is not so good after all; Yippee recently reminded me of those boules in a recent post (photos of this gorgeous loaf here!). or I've got something. I tried Josh's super-retard method. Different numbers than him or you but closer to you. This bread bites back. But whether it tastes as it should (I don't know) I can say it tastes good. Thanks for leading the way. It's my pleasure Varda and that is a handsome looking loaf you have produced there. Your crumb is very similar to mine. When you say 'it bites back', are your referring to the sour? I find this loaf is sourer on the second day. Freshly baked, the sour flavour is only slightly discernable. I have been experimenting more and have now settled on a recipe I am very satisfied with. I have got very consistent results for the last five or so bakes. My recipe is almost identical to my original one (except that I now add 4% maltose) and I have borrowed the long final proof from Josh. I now final proof in the fridge for 18 -24 hours and get a great russet brown colour with lots of blistering. As soon as I get the time I will do a write up on it. I can see blistering on the top left of your boule but I suspect there is more and it is just not that evident because of the lighting in your photograph. Maltose is a sugar? What's the theory? I got the idea from Debra Wink's thread on lactic acid fermentation. Here is the relevant quote. ...is it possible to add particular sugars (eg maltose-rich malt syrup) to bread dough in order to encourage the growth of and influence the metabolic behaviour of particular lactobacilli? Yes, you can add things to dough to influence end-product formation---they do it in industry. Increasing maltose in the dough could certainly increase activity of lactobacilli, which would increase lactic acid production. The maltose syrup I use looks like this. It is made from germinating cereals like barely and it is only half as sweet as fructose and one sixth as sweet as glucose. (Info from Wikipedia). So it is not super sweet. In fact you can't notice it in the bread at all. Not even slightly. I suspect it might contribute to the colour and I am theorising (along with Debra Wink) that it is food for the lactobacilli which is why I am getting a sourer all-white SFSD. Don't be discouraged from using the sponge method again. The key to using it is to mix your final dough quite a bit before the sponge peaks. If it is particulary warm and the sponge is very active I might use it after 2 hours. If you let it peak, it will be too acid and you will get too much proteolyctic activity and a very sticky dough with a likely collapse. Always following along here and am jumping in here to add a comment about maltos - which is simply non diastatic malt powder or also called barley malt flour. KA sells it in 1 lb bags and they also sell diastatic malt. I have been experimenting with the non diastatic malt powder, which is like the syrup you have pictured but in powdered form and easier to use. What I found out was that if one uses too much in a formula - the result is very thick and hard crusts. I was experimenting with it because I had read that not only does it add a bit of sweetness to a loaf but that it doesn't compete with the yeast for the water as other sweeteners do. I think this is also what is put into flours that are sold as 'malted flour' but I don't know since I do not buy flour. I can't recall the % I was using but I was using the powdered form in breads I was baking last week and I suddenly had 3 different loaves, both enriched and lean, coming out of my oven with really thick and hard crusts. The only common dominator was the malt powder so I concluded it was the culprit as nothing else had changed in my baking routine. NB: This does not mean it was the culprit but since I have gone back to honey or agave as sweetener I haven't had the problem so I am still thinking it was somehow linked....As with all things in my kitchen I will have to do more experimenting before I really can state it was the TRUE culprit....know what I mean??? Something comes to mind as I type because I was using powdered and you liquid therefore by weight 10% is really going to be very different. 5g of powder is going to be a lot more volume wise than 5g of the liquid which is much heavier. Kinda like comparing powdered sugar to honey in weight. The powdered form is really really light in weight. Guess I need to do some research in how to make adjustments when using the powdered compared to the liquid. considering that most nonorganic patent (white) flours contain some form of malt already, the difference between diastatic and non-diastatic is, in my view, overblown. as for malt, the liquid form generally contains somewhere around 16% moisture, so if you're using equal amounts by weight, you're getting about 20% more solids when you use dry. So my assumption was correct and now I know how to adjust in the future. By the way, I use the powder because it is so much easier to use than the liquid - or at least the liquid we have here in the States. It is very sticky and leaves long trails of itself like gossamer when trying to spoon it out of it's jar. (I think this is exactly like what you have too. Not as easy to use as honey because it is thicker and much stickier in consistency.) Easy to use if dumping into boiling water but when adding to a dough I just find the powdered easier to deal with. Less clean up. BUT beware, if you buy any of the powdered malt, it will get hard as a rock if exposed to ANY moisture so must be stored in a jar with a tight fitting lid. It is very sticky and leaves long trails of itself like gossamer when trying to spoon it out of it's jar. Janet, that is exactly what I have. So we are talking about the same thing. I spoon it out of the jar (trying very hard not to get any on the lip of the jar because it will cement the lid to it when you put it back on) and dissolve it in boiling water which I allow to cool to room temp before adding to the dough. Stan's conversion makes sense and that explains why you can use a lot more of the liquid form than you can of the dry form. I have never seen the dry form before, but now I will keep a look out for it. Thanks for the tip about not letting it get exposed to any moisture. I am in awe how someone from across the globe can shed light into my kitchen quandaries with such perfect timing in a discussion that isn't really related to malt in the first place! Yesterday, before reading this post, I mixed up a batch of Hanseata's (Karin) Malzbrot. Here. They are baking now and barley malt in the powdered form is used as the sweetener. It is only 1% of the total flour weight and still the crusts on the breads are harder than breads baked without barley malt. By the way, I do not consider a hard crust a problem. My problem was that I simply did not understand why, all of a sudden, I was getting breads with such thick and hard crusts. Today's bread have a hard crust but because the amount of malt in the recipe was scaled to the powdered form they aren't as thick as the ones on last weeks breads. Glad your crust quandry has been explained. In the meantime I have learned a lot about the different forms of malt. Had no idea they were so numerous and varied. Do a google search and you will see what I mean. Have you ever pushed the envelope on the diastatic form? I misread Susan's (of Wild Yeast Blog fame) baguette recipe once and added 10%! It resulted in the darkest looking baguettes I have ever baked. Inside the crumb resembled the papery covering of the gooseberry fruit. It was like all the substance had been eaten away in the loaf. Texturally it was very interesting and it had a great flavour, too. I have been meaning to repeat that mistake again. I did google searches on malt when I began making my own diastatic malt. I also followed along on the threads where Varda had lengthy discussions on the red malt used in the Borodinsky (sp?) loaf she was working on a while back. Interesting stuff. Any grain can be malted. I have malted rye, barley and wheat but ended up buying the non diastatic from King Arthur simply for the ease and the price is right. I guess I never got an email since you started a new thread and just missed this one completely. Syd the loaf looks great and near identical to my best results and better than my "not the best" results. I guess I left off the list the non diastic malt that is in the dough but I believe at a much lower percentage than yours. I believe its like .5% bakers percentage. As for the sour I have a few ideas of my own, and Varda's comment may back it up a bit. I think you may be missing some of the sour by using such a small amount of starter in your levain. I feed my seed starter once a day at the same time. I let it sit at room temp for 2-4 hours pending the temperature and let it get active and then retard overnight. 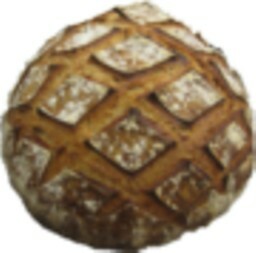 Maybe if you built a starter that lived in the fridge and made your levain from a cold seed you could increase the ammount of starter % in your levain. I believe Varda used 2x what you used and certainly semeed like it was sour. I kid you not our sourdough smells sour coming out of the oven. I do agree the crust is where it is at with this loaf. I also think after day 1 it is much superior toasted than "raw" as the crust crisps up so nicely and the crumb also gets a very nice crispness to it. It is a regulary panini bread at the cafe. The only other major difference which I don't think plays a big role but it may is I use High Protein Flour. I have tinkered with the same recipe using Malted Bread Flours and different timings and got excellent results. In fact I liked them better than the Sour I passed along. My favorite variation was using the same recipe yet a changed process. Add salt and mix to strong well developed dough. This variation boasted a good strong sour flavor but also had some sweeter notes and gained 20% more volume than the previous method. This also cut out a whole day of the process. For me this was better, for others not so much. So we kept the old version. So happy you did try this recipe and liked it and sorry I didn't see this sooner. By now you must have perfected "your" sourdough. PS I've had a few variations of SF Sourdough and I would not consider it super sour. I guess Boudin is the "namesake" and I have tried theirs. Its a nice sourdough but not "super sour" as you might expect. Apologies for not replying sooner but for some reason I wasn't notified of any new posts. In the past, if I clicked on the Track button, I could tell which entries had new posts but that doesn't seem to be working anymore. As for the sour I have a few ideas of my own, and Varda's comment may back it up a bit. I think you may be missing some of the sour by using such a small amount of starter in your levain. I think you are spot on there. I have had precious little time to bake lately and when I have baked, I have opted for tried and tested recipes rather than doing any experimenting. Things have eased up a little recently, so I should be able to give your theory a test in the not too distant future. I usually only feed my starter once a week (twice or three times if I am baking a lot) and, like you, I also leave it out until I notice some sign of activity before I refrigerate it. About 90 mins if it is all white and about an hour if it has wholewheat in it. My starter is very active in our extremely warm and humid climate. Your variation where you retard the starter has piqued my interest, too. I am guessing that also would contribute to a more sour flavor. I definitely want to try that. I also like the fact that you got 20% more volume. Interesting that the Boudin loaf is not that sour. Actually, I am not that surprised to hear that. I would expect an overtly sour loaf to appeal to fewer people. Still, I want to try for myself and see which I prefer. I still haven't succeeded in making a really sour all-white sourdough. Not anything that I can replicate anyway. However, you have given me some fresh ideas and I look forward to trying them out.